Both individuals and newcomer families are assisted in developing and implementing a plan for successful settlement in Lethbridge. Information and Orientation Sessions are provided to newcomers of all ages. Sessions are presented as skill-building workshops and introduce newcomers to the community, provide practical guidance to every-day living and information on rights and responsibilities. Many sessions are facilitated by community experts and where required interpreters are employed to ensure the information is easy to understand and applicable to all. Topics include: housing, health care, studying and working in Canada, legal matters, assistance with trade/professional certification and recognition processes, community resources, transportation, cultural and religious institutions, parenting, child care and out of school programs, roles and responsibilities of Canadian residents, Canadian laws and justice system, becoming Canadian citizen, Canadian taxation system, money and finances. Referrals are provided for newcomers who need help accessing community resources and services such as banking, health care, locating a home, government services and family benefits and/or cultural, educational, and recreational programs. Referrals are also made to partner agencies so that newcomers can register for English language assessment, English language instruction and community employment programming. Clients can also access other LFS-IS programs such as interpretation and translation services, youth based settlement support, enrollment and participation in the Community Connections Volunteer program and the Bhutanese Senior’s project. Solution Focused Counseling services help both individual and families to develop and implement strategies for adjustment to Canadian life. This may include social and personal support and linking with specialized services. This is not a therapeutic counseling service but referrals to the same can be made if necessary. The program is open to newcomers of all ages and includes the following immigrant status’ foreign live-in caregivers and other special groups (as determined by the Citizenship and Immigration Canada branch), family class immigrants, economic class immigrants and Government Assisted Refugees. Individuals and families who have applied for permanent resident status and have received an Approval in Principle letter from Citizenship and Immigration Canada are also eligible. Canadian citizens and/or newcomers who continue to experience significance linguistic and cultural barriers and who have lived in Canada for more than three years are also encouraged to apply. 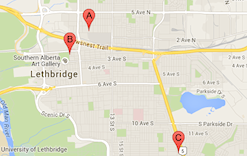 All services are based out of the IS office at 1107 2nd 'A' Avenue North, Lethbridge. Based on the needs of the individual client, Settlement Practitioners may also provide support in the community and at the clients’ home. All newcomers who have lived in Canada for three years or less are welcome to access this free service funded by Citizenship and Immigration Canada and the Government of Alberta. To access services, newcomers are asked to make an appointment with a settlement practitioner by calling 403-320-1589. A pre-intake assessment will be conducted to ensure appropriate referrals are made. The settlement practitioner will help determine which services will best serve your unique circumstances. It is important that all family members attend the initial intake and assessment appointment. Receive a comprehensive intake and needs assessment to help set settlement goals. Gain knowledge and skills to so they can better manage everyday life in our community. Be connected with community and government resources. Receive materials, guides and resources so they can research and access other community services. Receive ongoing support and guidance during their settlement process, to achieve their settlement goals. Receive support and encouragement to build self-sufficiency and economic independence.